Awesome BOD members, it is with great pleasure, and a little trepidation that I will be outsmarted in the process, that I am able to help us all get to know better, author and fellow BOD member, Travis Mohrman. Thank you so much for taking the time for this fun author spotlight! I was just napping on the couch, I have plenty of time. By the way, who let you in my house? Was it the cat? That dude can’t be trusted. He didn’t try to put anything in your pockets, did he? Maybe ask you to deliver a message to someone? Don’t do it! Don’t be a mule for the cat! Anyway, can I get you something to drink? Perhaps some goldfish crackers? Don’t mind the smaller hound, he’ll calm down in several minutes. It’s so interesting for us to learn how authors decided they wanted to be a writer. Can you tell us about the first moment you knew that you wanted to be a writer? Well, I was kind of drunk. Do you like my flannel Voltron pants? Not an easy thing to find for a tall guy. Anyway, what was the…oh yeah, how I started writing. Well, I had heard about NaNoWriMo, but I had never really written anything other than snarky emails to those deserving of the snark. Then, on the last night of October, my wife’s friend was in town and we were drinking rather heavily in our living room. With purple stained teeth, I declared that I was going to write a novel! Nobody really batted an eye, I am rather prone to large declarations that come out of nowhere. Christina, our guest, asked what it was going to be about. I replied with something close to “plants and dogs, maybe some homebrewing…” Seriously, that’s how it went down. Then, we drunkenly threw around story ideas and I wrote down an outline type thing because we weren’t really doing anything else. I don’t really have any neighbors so kids aren’t coming by asking for candy on Halloween. Anyway, this outline had something to do with three different societies fighting each other and then somebody changed sides, I don’t know. I threw it all out the next day and just started typing. I’m not one of those authors to claim I have to write just to get the stories out. I’ve never secretly wanted to write. I’m just a normal guy with very large feet who daydreams all the time. Sometimes I write those daydreams down and other people seem interested in reading them. What made me keep writing was meeting amazing indie authors that are very talented. Guys like Tony Bertauski and Rick Gualtieri blow me away with the stories they write but they seem to be just normal, down to earth guys who share the same dashing looks and chiseled physique as myself. 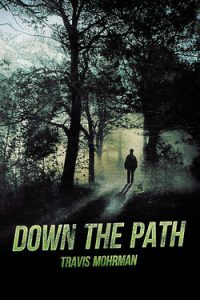 Down The Path is the first book in the Path series. Although it is a dystopian book, I loved that it focuses on the good in others, rather than how poorly people can treat each other when hard times come. What made you want to write a book like this? I love the Dystopian and Post-Apoc genres, but my biggest complaint is that I don’t think the people are very realistic. It seems that in many books, the fear of law is all that keeps society from plummeting into madness. To be fair, I think in any kind of apocalyptic scenario there would be massive chaos and lots of fighting, looting, etc…but that would all end pretty quickly. I think that people, as a whole, are good and more than willing to help someone in need, even a stranger. Down The Path is set roughly 500 years after a collapse, so it’s just people trying to survive. Vastly fewer people equals more outreach and compassion for your fellow man. If your car breaks down on a country road, how many cars drive by and don’t offer to help? I love all the interesting survival skills and details that Cooper has to learn in order to survive. Can you tell us how much of his knowledge is or isn’t from personal experience? Pretty much all of the things in the first book came from personal experience. Even the illness that Cooper contracts (that was a helluva week). I have long been a fan of survival skills, but it was never really for any fear of society collapsing. It was because I wanted to learn how make fire several ways. It feels good to know how to do things, especially things in the woods. Also, it impresses the dickens out of the ladies. What is the craziest survival story you have experienced, or would love to experience? I fell down a cliff once; that was painful and bloody. I’ve worked on over 100 prescribed fires and that has led to some very interesting experiences, but nothing really “survival level.” Who needs body hair, anyway? I also got lost in the woods in southern Illinois when I was around 13 or 14. I was out hiking with my uncle and I wanted to follow a trail by myself. I got all turned around when the trail inevitably vanished and I began rationing my Certs (which was the only thing I had on me). I generally walked downhill until I hit a small river and then followed that because at least I knew I wouldn’t walk in circles. Then I saw some power lines and I followed those because it was easier walking and I knew that they had to lead to people. They eventually led me to a road and I walked down that until I ran into my uncle who was more than a little worried about me since I was gone for many hours. We decided not to inform my mother about the day’s excitement. It’s been twenty years since then, so I figure the statute of limitations has expired, so I’ll go ahead and make the story public! I did two ten-day backpacking/portaging trips through the wilds of Canada when I was in the 7th and 8th grades. You could drink the water straight out of all those lakes, it was amazing. Truly, none of it is too crazy, though. As far as what I would like to experience…I just like being outside. Whatever happens or doesn’t happen, I’m happy. When you’re not writing books, what are some of your favorite hobbies, and do those hobbies transfer into the details of your characters? I draw heavily from my hobbies for my writing. I like to brew beer and wine. We cure all kinds of meat from hard salami to bacon to ham. I hunt and fish and my wife and I proudly do all of our own butchering. I really enjoy woodworking. I love to cook. I really just like making things. Not only for the pride that comes with enjoying the fruits of your own labor, but also the look on people’s faces when you give them a pound of the best bacon they have ever had and then tell them that you made it. One last question. If you had the opportunity to be and do anything for a day, what would it be, and who would you want to be with you? Pretty much whatever I’m doing I want my wife and hound dogs to be with me (you can keep the cat). This way, when I do something spectacularly stupid, I have someone else who can back up the story as well as drag my battered body out of the woods. As far as the first part of the question, I’m happy being me. I’m all broken in like a good pair of boots. If I were to try to be someone else, I bet I would get blisters. Wait…unless I got to be Wolverine! Is that an option? I would like to be him, but I want to stay my same height. Yeah, I would be a tall mutant with healing abilities and an Adamantium covered skeleton. Plus, because of the healing factor the blisters wouldn’t be an issue. What are your writing habits like? Do you write every day or just when time allows? I tend to write very quickly. I go through writing phases, basically. When I’m writing a story, I will lay down at least 2,000 words a day, every day. After a month I have the book written as well as one round of edits and it’s off to the editor. I usually write after work. I have about an hour or so between when I get home and when my wife gets home and that’s when I write. This is where she really shines because instead of cleaning the kitchen or doing any chores after work, I am sprawled on the couch pushing down little black keys. I can’t thank her enough for picking up my slack while I’m in one of these phases. Thankfully, those only come about every 3-4 months. The rest of the time I just let the next book unfold in my brain. Which means I basically just play video games sans pants. Are any of your characters actually based on you? I think I strive to be Cooper, all full of optimism rubbed with a decent portion of luck. I also think a part of me is afraid of turning into Handro. He’s not a bad man so it’s not terrible to turn into him, but he’s clearly kind of broken and supremely jaded and I hope I’m not that way. Some of my other characters are based on my friends, though. Ceannt is a real man who brews beer with strange ingredients and plays the bagpipes. Brian, from Singular Points, is based on a very good friend of mine. What I tend to lift from my friends is their attitude. I really have no idea if other writers do something similar, but it helps cement the characters in my head. The character of John from Down The Path and Futher was meant to be based on someone but while writing him, nothing fit and he became the John that is in the story, kind of a lovable but slow giant man-child. Not really. Some people will understand it immediately, others will hopefully seek enlightenment. Thank you so much Travis for letting all of us at BOD get to know you better and for sharing your talent of writing with us! Thanks a ton for coming into my house and waking me up from my nap. No, really, it wasn’t awkward at all. Oh, before you leave, please check out the authors of DeadPixel Publications. It’s a diverse mix of writers all under the same roof and you can certainly find something for any taste there. Enjoy your burrito, everyone. 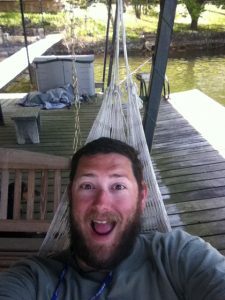 Travis writes stories about plants, dogs, and maybe some homebrewing. Several generations after the collapse of civilization, an isolated city is fighting to survive. Food is scarce, resources limited, and the population is dwindling alarmingly fast. Twenty-year old Cooper, marked since birth by his bright red hair, is selected to embark on a journey of a lifetime to bring hope and prosperity to his city. Prepared as best as he can for the unknown, he sets out with little idea of what he will find. Along the way he forages for food, battles sickness and the swift current of a river, and finds an unlikely companion – an immediately faithful dog he names Lupe. The duo follow the great river south until they find themselves invited into a thriving village. Cooper knows he must learn all he can and use this knowledge to save his own city before it’s too late. Down the Path is an enthralling adventure story backed with real-world survival knowledge. An exciting read for all ages!